A formal training program with theoretical and practical components is essential for all emergency medical personnel involved in providing care for critically injured patients. Communication, effective first aid, and on time transportation to a health center play a major role in improving quality of care for critically injured patients. Using life experience examples, participants in the study emphasized the importance of each factor on the delivery of quality care for critically injured patients. Recommendations based on the study findings included two main categories. The first category illustrated recommendations to stakeholders, and the second category reflected recommendations for further study. Stakeholders in this study included healthcare leaders in Afghanistan, healthcare professionals involved in providing health care in Afghanistan, and local people in Afghanistan. The modified van Kaam method in the qualitative phenomenological study involved conducting semistructured interviews, which were audio-taped and transcribed. The rationale for using the phenomenological approach in the qualitative study was to describe in-depth experiences of health care professionals. Moustakas’ (1994) modified van Kaam method explored the lived experiences and perceptions of 17 doctors and nurses relating to emergency trauma care for critically injured patients. 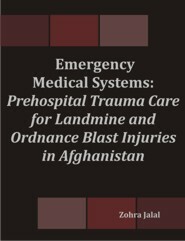 Data analysis revealed important factors that could enhance the quality of prehospital care for civilian casualties of landmine and unexploded ordnance (UXO) blast injuries in Afghanistan. The four major themes that emerged from participants’ responses to interview questions included communication, formal training for emergency medical personnel, transportation to a higher-level center, and quality of prehospital care.